There are a number of reasons to regularly photograph sail shape, from tracking the condition of the sail to figuring out why you can’t point. However, getting a reliable photo can be quite difficult. Quantum experts Mark Reynolds and Doug Stewart weigh in with their advice on snapping the best photos. The best way to evaluate your sail shape is to photograph your sail while onboard. These photos provide valuable information about trim and tuning, not to mention information about the condition of the sail. 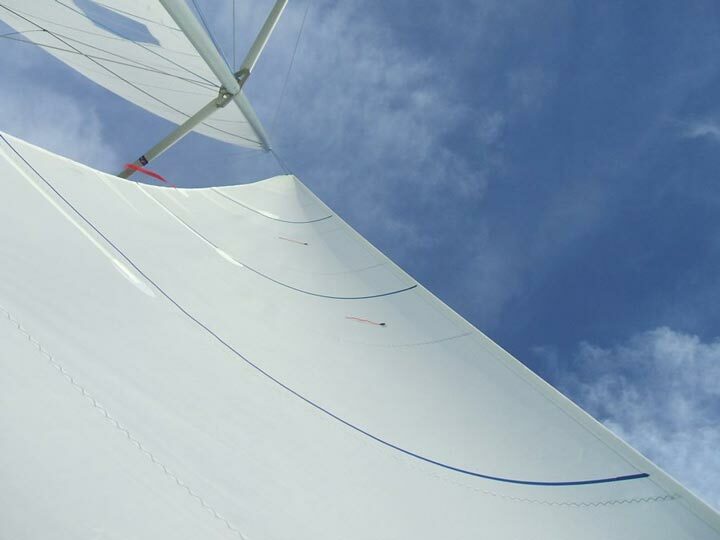 We recommend you get a good shot of your sails’ shape as soon as you get them. This provides a baseline as your sails age and stretch. 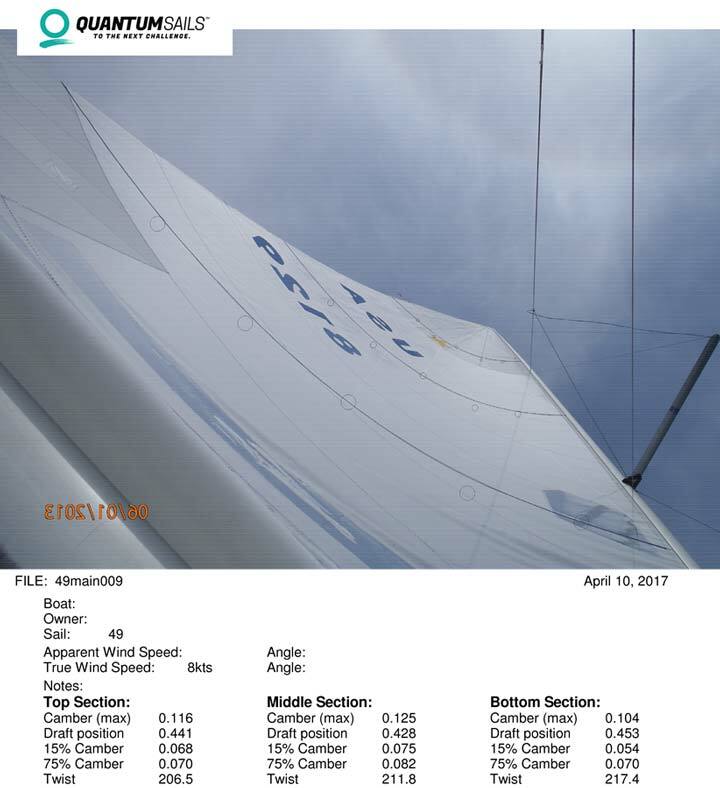 Take at least one set of photos each year–preferably at the beginning and end of the season and share with a sailmaker, who can measure the draft (depth) and draft position to determine the shape of your sail and whether it’s time for a recut. Sail shape photos are also valuable for evaluating performance. The photos can give important clues to the problems you may have, especially when paired with the conditions. For example, if your sail is too full, that might be why you’re having trouble pointing. A recut or some tuning and trim adjustments could solve your problem! If you’re not able to diagnose the problem yourself, send the photos to your local Quantum loft. In the past, photographing sails was a fairly complicated process involving developing film, making prints, and then retaking photos if they didn’t capture what you needed. Today with digital camera and computer measuring programs, it’s very quick and easy, but it’s still a bit of a trick to get proper photos. The most important part of taking the picture is to hold the camera on a diagonal angle. The image needs to include all the draft stripes so your sailmaker can view the entire sail. Be mindful: The most common mistake amateur photographers make is leaving out the lower draft stripe. Sailmakers need the whole picture (pun intended)! When photographing the sail, position yourself slightly to the windward of the sail foot, in the middle and as low as possible. Hold the camera diagonally, lining up the luff end of the lower draft line in one corner and the leech end in the opposite corner. This angle provides an image that includes all three draft lines for most mains and jibs. Low aspect mains and genoas are a bit tougher to photograph because of their shape, but with the right camera and angle, it’s possible to capture all three draft stripes. To photograph the whole sail, you’ll need a wide lens. Most smartphones have fairly wide angles. If you’re using a camera, one of our favorite models is the Olympus Tough. The tough models are fully shock-proof and waterproof. The best photos for sail evaluation are taken in 7-10 knots of wind. Stronger breezes can backwind of the main. It’s also challenging to take properly angled images in small boats when you need to be hiking out. If you are trying to compare two similar sails, make sure the wind strength doesn’t change between snaps and that the setup is exactly the same. If possible, keep all rig settings the same, and put up and take down all the sails in a single session. When you take the pictures, make sure to record the wind strength for reference. 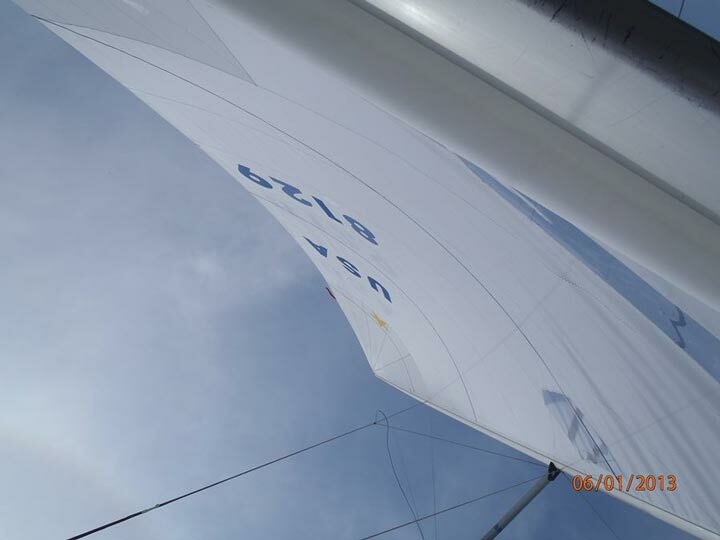 If the foredeck is large enough, lay on the deck next to the midfoot and look up at the sail. Line up the camera diagonally with the line between the tack and clew. A simple trick is to place one finger under the forward corner of the camera so that it’s aimed at the jib head. Initially experiment, and then check the photos to make sure you are getting the luff and leech at the lower draft line. It’s important that the tell tales stream back with no luffing for the jib photos. On a small boat, skip the viewing screen and hold the camera on the deck in the middle of the jib foot to take the picture. Review the photos as you go to ensure you have the correct angle and all three draft stripes are included. When shooting sails on a big boat, your best bet is to lay in the cockpit directly under the mainsail and slightly to the side of the boom (on a smaller boat, position the camera like you did for the jib). Make sure the boom does not block the lower draft line, but do include the boom in the photo if possible. Hold the camera diagonally with the luff in one corner and the leech in the opposite corner to include the entire sail. It takes practice to capture sail images perfectly, but, in the age of digital cameras, trial-and-error is encouraged. The important takeaways are to include the entire sail with all the draft stripes and to record the wind speed during the photoshoot. Armed with these photos, you and your sail professionals will gain the best sense of what’s happening with your sails, and you can create a plan for what you can do to make them as efficient as possible.